In WellBeing Alignment Sessions you can learn how to let suffering automatically unwind... and discover you are the Peace that was underneath it all along! ... chances are you want what you're experiencing to go away, right? What I've discovered, however, is that wanting and trying to make it go away keeps it all stuck. It's exactly the opposite of the way we think it is. Are you wondering... "How come all the things I've tried haven't brought me happiness?" Focus on outer effects, not the root, underlying CAUSES of suffering. Perpetuate the perspective that you are a separate body / mind, rather than the wholeness of peace that you actually are. Are based on the belief that you need to ADD something to yourself or your life, in order to be happy. This keeps you distracted, trying to find happiness “out there,” which is exactly where it isn’t. Or, are based on the belief that you need to GET RID OF something in yourself or your life to be happy. This belief, which keeps you divided from yourself, is one of the root causes of suffering in the first place. Whenever you push against what is showing up, whether it is within you or in your life, you suffer, because essentially, you are pushing against yourself. You don’t need to ADD anything to yourself or GET RID OF anything about yourself or your life in order to be happy! If you’re suffering, your attention has just been distracted from the “you” underneath that is ALREADY happiness itself. Your predominant "point of reference" (what / who you identify yourself as) determines your experience of your life. However, You CAN learn how to LET it unwind by itself, with the spiritual energy healing of WellBeing Alignment Sessions. How do I know that WellBeing Alignment Sessions can help you? Because these sessions are the phoenix arising out of the ashes of my own suffering. For most of my adult life I was a cowering little girl in an adult body, afraid of the world and the people in it. My life was about frequent episodes of deep depression, panic attacks, suicidal tendencies, intense self-judgment, numerous unfulfilling jobs, and eating disorders (bulimia and anorexia), as well as other addictions (recreational drugs, alcohol, relationships and pretty much anything that I hoped would ease the pain). I tried everything, desperate to unlock the door of the prison of suffering. I was determined to find the key. To find a key to unlock the prison of suffering and share it with as many people as I possibly can. By following Inner Guidance, a unique and powerful method of spiritual energy healing emerged that has completely changed my life. I now know myself as what I call “This That Is Simply Here” – an unlimited peace that doesn’t go away, even when upsetting events occur, and an inner strength beyond anything I’d ever known possible. By practicing the same methods I share with you in WellBeing Alignment Sessions, I continue to experience the automatic unwinding of layers of debilitating beliefs, and their painful effects. As I continue to let go into the Self, Pure Awareness, I experience an ever-deepening, loving acceptance of what I call the "Kai critter," which automatically extends out to include everyone and everything in my experience. AND... I am deeply honored and very happy to share with YOU, and many other wonderful beings all over the world, the keys to unlock the prison of suffering. And they can change YOUR life too! Within your greatest challenges you will discover a golden strength that has been here within you (AS you) all along... and I can’t wait for you to discover it! It brings me great joy to share WellBeing Alignment Sessions with YOU, and offer you a direct path out of the prison of suffering. Your invisible world creates your visible world. What causes suffering in the first place? In the depths of your unconscious mind is an accumulation of your cultural conditioning and limiting beliefs about yourself, other people and the world. The unconscious mind is like a movie projector, and what shows up in the every day experience of your life is the movie. Deeply held beliefs in the unconscious mind, including the belief that you are a separate entity rather than whole, pure Awareness, which is what you actually are. Resistance to what is appearing within you or your life. Focus on the CAUSES of suffering, which then facilitates the unwinding of the painful effects – automatically! Simply and directly bring your attention to yourself as Awareness, the peace that you ALREADY are. Give you the direct EXPERIENCE of love and healing, not just an intellectual concept of it. Recognize that nothing needs to be added to you or “released” from you in order for you to be happy. If you are suffering, the only thing missing is the acceptance of all aspects of yourself AS YOU ARE, but you can’t fully do that from the body / mind, self concept you believe yourself to be. In WellBeing Alignment Sessions, as you consciously discover your Self, Awareness, THAT “you” already IS acceptance. Keep you from falling into the trap of the linear mind. The linear mind is like a hamster wheel. It only knows the past. It continually recycles the past and projects it into the future. We are conditioned to listen to the rehashing of “who did what to who” and be stuck in that story of suffering for years! WellBeing Alignment Sessions guide your attention off the “hamster wheel” and into the Peace that you already are. Are designed to give YOU the tools to continue on your healing path without being dependent on a healer. Are amazingly simple, direct, and easy to learn. Help anyone who is drawn to them, and is willing to practice what they learn, including children. In fact, children often learn these methods even faster than adults because there is less conditioning in the way. “Dearest Kai, thank you from the bottom of my heart for the session. I wish I could hug you!! It’s as if a big weight has been lifted, and I discover what this life is about slowly. First, together, we shift your point of reference from suffering to peace. Your attention and reference point is gently shifted away from the “you” you’ve believed yourself to be (your body, mind, name, history, self-concepts, beliefs, sensations and emotions) to the You that you actually are – Awareness, the peace that has been in the background of your experience all along. As you begin to KNOW yourself as Awareness, you will immediately feel relief. Second, we address the specific manifestations of suffering within you. You are guided into accessing your unconscious mind by allowing the sensations in your body (which are directly linked to the unconscious mind) to be here exactly as they are. This initiates a spontaneous, gradual spiritual energy healing and allows your constricted feelings, sensations and associated beliefs to gradually unwind on their own, especially if you continue to practice what you are given in these sessions in your daily life. We also look at the basic blueprint of your life – your unconscious or conscious belief system – as it shows itself within your session. Once you are able to see the blueprint you've been living by, then together we can gently question it's actual validity. It is only when we become conscious of and question the blueprint we've been living by that we can let it go and be free of it. Is healing with WellBeing Alignment Sessions really that simple? However, your conditioning, which tells you (and not just you, we all deal with similar conditioning) to avoid anything uncomfortable, will kick in at various points along the way, and you will at times resist sensations and feelings that arise. When that happens, (and believe me, it will!) you will learn how to meet the resistance with kindness, love and acceptance as well. Likewise, your conditioning will find ways to avoid letting your attention rest in Awareness, the peace that you already are. So, I will show you some simple and direct ways to keep bringing your attention and reference point back to yourSelf, Awareness. What can you expect to experience with learning and continuing to practice WellBeing Alignment Sessions? As your attention shifts to the background of your experience and you get to know yourself as the Peace that you already are, even if it is just for a few seconds, the very first thing you’ll notice is relief. A sweet relaxing of constriction. Then, the more you rest in Awareness, gradually, relief broadens and deepens into an unshakeable knowing-ness that all is well, even if / when extreme emotions arise. Identifications and beliefs about being alone, separate, and lacking gradually fall away as you directly experience a clear, bright foundation of strength and connection within you – Awareness. When you know your Self as Pure Awareness, even on the level of the dream (this physical life), your attitude toward the character in the dream you think you are and your life decisions will now come from a place of loving and taking care of yourself in truer ways. As you rest in the truth of what you are – Awareness – a natural, easy joy is uncovered within. You are aliveness itself! As you continue to know yourself as Love, it (you) simultaneously includes ALL your experience – your relationships, your daily activities, and your perspective of the world. As a result, your experience of the world and the people in it automatically becomes more harmonious as well. “I just have to say thank you so much for the wonderful session this last Saturday! Wow!! I am still processing and learning from it. The work you did with me has helped me tremendously. I feel like I have stepped into a new phase of my life. You told me my inner child was excited to share stuff with me and that my root chakra had wisdom I would now tap into. Since that day I have a whole new outlook on life. It feels like I am gaining new knowledge and understanding that I didn't have before. Since ‘meeting’ this little girl inside me, I feel like this is the first time in my life that I have truly begun to forgive and love myself. 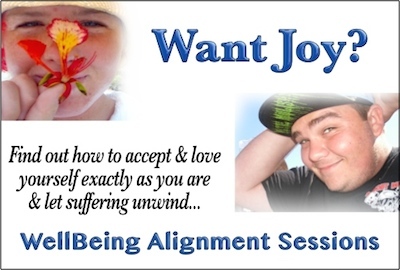 How will your life change with WellBeing Alignment Sessions? The unconscious mind is the movie projector and your life is the movie. For example, let’s say your boss fired you and you felt inadequate, frustrated and angry. The belief of being inadequate, (which produces frustration and anger that is either below your conscious awareness or floats in and out of your conscious awareness) was ALREADY in your unconscious mind. The energy of this belief then creates events, such as getting fired, that reflect them. When the event occurs it gives us the opportunity to now CONSCIOUSLY see what was in the unconscious mind all along. The frustration and anger aren’t created by the event. The event is created by the belief in being inadequate that was already in your unconscious mind, along with the resulting frustration and anger. As you practice what you learn in WellBeing Alignment Sessions, you will allow all feelings of un-ease within you and your life to be as they are. As a result, they unwind on their own. These uneasy feelings are connected directly to the unconscious mind. By allowing them to unwind, the beliefs in the unconscious mind shift automatically as well. Remember that the unconscious mind is the movie projector and your life is the movie. As your “movie projector” let’s go of debilitating beliefs, your “movie” shifts accordingly. As your attention rests more and more on the peace of Awareness, eventually your life will reflect it. I’m delighted to share WellBeing Alignment Sessions with you, because I know from my own experience how profoundly they can change your life. I also know from my own experience that these sessions are not a quick, immediate fix to all your problems, although 99.99% of the people who experience WellBeing Alignment will feel relief in the very first session. You are coached in how to know your Self as peace and to let go of suffering. However, to free yourself from the tangles of distress, you must be willing to practice daily the simple yet powerful techniques you learn in these sessions. Suffering has a momentum that gradually but steadily lessens when we no longer feed it. In these sessions you'll learn how to stop feeding it and to instead live in the peace you actually already are. When you do that consistently, suffering unwinds by itself. You’ll know if WellBeing Alignment Sessions are the next step for you. You’ll feel an inner “yes” about it. We’re always magnetically drawn to whatever is the next step is for us. And here you ARE! Listen to your heart. If you get a feeling that this might be what you've been looking for, then I invite you to take action and reserve a spot for yourself in the appointment schedule. “Words cannot adequately describe how profound my two sessions with you have been. Our work together has been transformational beyond my greatest hopes and expectations. I have never worked with a more gifted mentor and healer who had such a deep understanding of who I am, and of the underlying thoughts and limiting beliefs perpetuated by my ego that have served to keep me small. You saw right through my words and mental confusion, cutting straight through my ego’s games, and peering into my soul. By pinpointing very specifically what has been at the heart of my ‘stuckness’ and frustration, you empowered me with full knowledge of these underlying beliefs, and then gave me powerful strategies to ‘catch’ them and to turn them around. Your depth of understanding is unparalleled. I have never felt so deeply UNDERSTOOD by anyone. You don’t have to make suffering go away. And in fact you can’t MAKE it go away. Instead, you can learn how to LET it unwind by itself automatically. You can now discover this for yourself, rather than remaining stuck. Your life doesn’t have to be about suffering. In this moment you can decide to live from the truth of your being, the only place of true peace. Once you know and experience the unshakeable truth of your being, you can live from peace even when turmoil arises in your life for release. All love and blessings to you! May you deeply know yourself as the Peace you actually already ARE.